NHTSA said that cars in the pilot project were able to transmit and receive messages from one another despite being made by different car companies. WASHINGTON -- Federal rules requiring new cars and trucks to have vehicle-to-vehicle communication equipment will be proposed earlier than expected as part of a government move to speed the deployment of connected-car technologies. The National Highway Traffic Safety Administration plans to issue a proposed V2V mandate by year end instead of in 2016 as originally planned, U.S. Transportation Secretary Anthony Foxx said in statement today. The Transportation Department also will craft a plan to test whether the airwaves used by connected cars can be safely shared with other wireless devices, Foxx said. 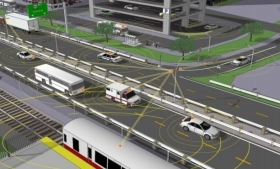 “Connected, automated vehicles that can sense the environment around them and communicate with other vehicles and with infrastructure have the potential to revolutionize road safety and save thousands of lives,” Foxx said in a statement. While a mandate likely wouldn’t take effect for years, the government wants to get the technology on the road quickly. It’s seen by U.S. regulators and automakers alike as a potential breakthrough in improving road safety. Warning drivers that they don’t have enough time to make a left turn, or warning them to stop when another driver is about to run a red light, could prevent nearly 600,000 crashes and save more than 1,000 lives annually, NHTSA has said. Yet despite the potential and more than a decade of research, deployment of the technology has been bogged down as regulators try to settle on minimum standards. Meanwhile, as demand for wireless bandwidth from smartphones and cloud-based data storage has exploded, lawmakers and federal agencies have called for allowing nonautomotive devices to share the airways dedicated to connected cars, prompting concerns from the auto industry about potential interference with wireless signals. Now, networking company Cisco Systems has developed a possible way for the different industries to share the airwaves without such interference, according to a statement from the Alliance of Automobile Manufacturers, which represents General Motors, Ford and Fiat Chrysler. In a meeting with the Federal Communications Commission last week, representatives from the alliance and Cisco discussed a proposed test of the technology to be done at Denso International America’s lab in Silicon Valley, a spokeswoman for the alliance said. Global Automakers’ Bozzella also mentioned the testing with Cisco and Denso, which supply V2V communications hardware and software.